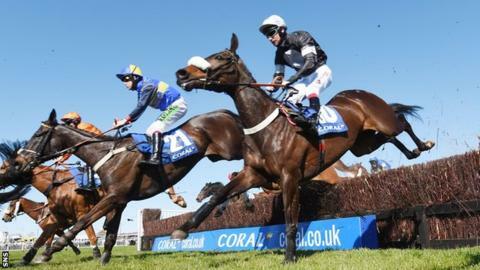 The Scottish Grand National and Ayr Gold Cup Festivals attracted a combined attendance of more than 40,000 spectators. Attendances at Scotland's five racecourses topped 308,000 visitors in 2015, the largest for seven years. It has seen a rise of 3.5% in a year, and 13.7% over the past three years. An estimated £173m boost to the Scottish economy comes annually from the sport. "The racecourses are being rewarded with increased attendances through their brilliant promotion of the sport," said Scottish Racing chairman Sir Ian Good. In their annual review, Scottish Racing also revealed that a record £6.7m was paid out in prize money, with £210,000 paid at the Scottish Grand National, second only to Aintree's Grand National. Three of the course - Ayr, Hamilton Park and Musselburgh - were named among the top 12 racecourses in Britain by racehorse owners, with the other two being Kelso and Perth. "The great strength of horseracing in Scotland is the united approach adopted by the five racecourses," said British Horseracing Authority chief executive Nick Rust. "One of the success stories is how the racecourses attract runners from not only south of the border but also overseas. While the sport is in such capable hands, the future is bright for horseracing in Scotland."